I love Applegate Farms Turkey Uncured Nitrate-Free bacon. Did you know that BJ’s Membership Club carries a variety of wonderful Applegate Farms products for your family to enjoy? I made my hubby a hearty breakfast yesterday morning with some of their bacon and then used the rest of the bacon for Corn Chowder for dinner. Begin making your “chowda” (that’s how New Englanders say it) by crisping up your turkey in a little canola oil. Once crispy, remove the bacon onto a plate lined with a paper towel. Set aside for later. Next add the onion and cook until translucent. Add garlic and cook for one minute. Now add your thyme, salt and pepper, diced potatoes and chicken stock. Cook for ten minutes or until your potatoes are tender. Next add the half and half, cream, corn, onion and garlic powders. Taste to see if more salt and pepper need to be added. Puree the chowder with a hand blender or in a food processor. If using a food processor be careful placing hot liquid inside. Remove the circle from the top of the lid and place a clean dish towel over. Puree until smooth. Pour your chowder into bowls, sprinkle extra corn, parsley, crispy bacon on top. Finish by grating some good fresh Parmigiano Reggiano cheese over top. The saltiness of the cheese brings the sweetness of the corn out! Pick up a great big spoon and enjoy! 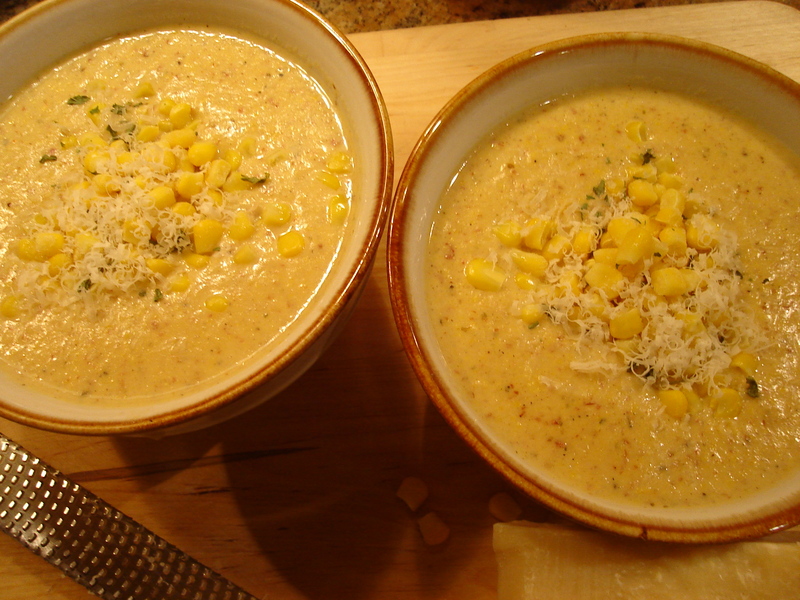 4 Comments on "Corn “Chowda”"
Sounds wonderful, and I love how you carry over your leftovers to make a fresh and inviting second meal! Hi Joan! My grandmother and parents alwasy taught me to never throw anything away! Thanks for stopping by and commenting! That bacon looks great. I am going to BJs and getting some. Love the chowda recipe! So happy you like it! You know I LOVE BJ’s!